There are plenty of reasons to seriously examine Russia’s role in Afghanistan, but too many articles fail to ask questions fundamental to making sense of Moscow’s aims. By refusing to closely scrutinize the facts on the ground, the role of China, and the logic of U.S. policy, the authors of many pieces can claim expertise but never be held accountable for their analysis. Russia is certainly an adversarial power for Washington, but Afghanistan deserves more than talking points from an aerial view. The initial public fears of a deepening ties between Russia and the Taliban date back to early 2016 when Russia’s special envoy to Afghanistan, Zamir Kabulov, stated that “Taliban interests objectively coincide with ours.” Both Moscow and the Taliban perceive the Islamic State (ISIS) and its local branch (Islamic State-Khorasan Province, or ISKP) as an enemy and Russia would rather see a stable government in Afghanistan with whom it can negotiate over issues such as drug trafficking and regional integration initiatives. By working with the Taliban, Moscow could give life to what it saw as stunted negotiations for a political settlement to the conflict between the Taliban and the government in Kabul, as well as gaining a military partner interested in fighting ISKP on the ground. The Taliban had launched a winter offensive going into 2016, a move aimed at gaining bargaining leverage for potential peace talks. Later in February, Moscow delivered 10,000 automatic rifles to Kabul for Afghanistan’s security services, per existing agreements. Russia was clearly engaging both sides politically, but more comfortable openly offering military aid, however small, to Kabul. The general consensus between Kabul and the U.S. military in 2016 appeared to be that Russia was largely offering political support and engagement. However, many were concerned about meetings between Russia and Tajikistan assumed to have implications for Afghanistan’s northernmost provinces. It’s worth noting that any state with a stake in the region would logically have established some kind of contact with the Taliban and Russia was not exceptional in this regard. The discourse shifted in March 2017. At a hearing with the Senate Armed Services Committee, NATO Supreme Allied Commander, Europe Curtis Scaparrotti said, “I’ve seen the influence of Russia of late — increased influence in terms of association and perhaps even supply to the Taliban.” Scaparrotti did not elaborate on the comment, but Taliban officials continued to insist that Russia’s contacts remained political. The general’s written testimony did not touch on Russian activities in Afghanistan and Russian officials continued to deny the veracity of such claims. By April, an anonymous U.S. military source in Kabul suggested Russia had increased arms shipments to the Taliban over the previous 18 months and General John Nicholson, U.S. commander of Resolute Support, would only say that he “would not refute” the claim that Russia in fact doing so. More precisely, he said that “we continue to get reports of this assistance.” In other words, there was never a formal confirmation, but indefinite statements designed to cultivate the appearance that it was the case. U.S. Secretary of Defense Jim Mattis added that any arms shipments into Afghanistan would be in violation of international law. The media in the United States largely accepted this line. In August 2017, U.S. President Donald Trump elaborated what was charitably described as a strategy for Afghanistan. Really, he committed the United States to seeking his own “peace with honor” in the same vein as the Nixon administration in Vietnam. There would be no withdrawal and the administration was authorizing the deployment of over 3,000 more troops and changing the rules of engagement. There would be no timetable for withdrawal. No major report since last October has emerged confirming that Russia is, in fact, arming the Taliban. But the story lives on due to basic misconceptions and analytic failings. First, little scrutiny is applied when Taliban, or other non-Taliban local leaders, claim the Taliban are being armed by Russia. They have their own interests in stoking the story, namely the appearance of broader international support or as a means of demanding more arms and financial aid from the United States via Kabul. Second, Taliban fighters could come into possession of Russian weapons for various reasons beyond Moscow’s control. Weapons given to Kabul’s security services could easily end up in Taliban hands after a battle. Weapons from the Soviet period still circulate around the country. Arms can be smuggled across borders from Central Asian states or Iran as well without official sanction from Russian authorities. Chinese knockoffs could also be used. CNN footage from mid-2017 showing Taliban fighters with Russian weapons was likely explained by these factors. Mattis’ reticence to assign blame deserves more attention, as does the challenge of Afghanistan’s porous borders. Finally, the assumption that Russia is the problem conveniently serves other policy ends for the United States. Namely, the U.S. presence is increasingly predicated on countering China in Eurasia and maintaining military assets near Iran — but neither of these motivations are politically expedient to iterate clearly. In January 2018, General Dawlat Waziri – an Afghan official – told Fergana News that an agreement had been reached with Beijing in December for China to finance the construction of a military base in Badakhshan. The Afghan officials quoted cited China’s concerns about radicalized Uyghurs crossing the border as well as other cross-border terrorist threats to Xinjiang. China vehemently denied any such agreement existed. Officials in Kabul continued to insist that the agreement was real, putting Beijing in an uncomfortable position. The Taliban launched an attack in Kabul itself at the beginning of February. The United States responded in Badakhshan province by using a B-52 to drop a record 24 precision-guided munitions on Taliban camps and positions. The B-52 strike was, in large part, a signal to any outside partner, including China, that the United States ultimately has the most firepower to secure and police the border region as needed. China has since begun trilateral talks with Pakistan and Afghanistan to encourage the Taliban to negotiate for peace. The diplomatic initiative parallels deepening security ties to Tajikistan, namely in the form of financing border outposts and an intelligence sharing agreement last year that drew Moscow’s attention. In March, the International Crisis Group released a report claiming that China had built a military installation in Tajikistan’s Gorno-Badakhshan, a sparsely populated, incredibly poor region covering half of Tajikistan’s territory. China’s rationale was straightforward: if you can’t build a base in Badakhshan, Gorno-Badakhshan isn’t a bad backup location. In April, Moscow reiterated its commitment to sustain security ties and strengthen Tajikistan’s border security per arms agreements reached last December. This subtle back-and-forth continued through the Shanghai Cooperation Organization’s largely empty summit in China this June. Then Russia launched training exercises with Tajikistan in mid-July in Gorno-Badakhshan, a break with standard exercise protocol to remind Beijing that Moscow remains the primary external security guarantor for Dushanbe. Through these twists and turns, China has become one of the primary policy drivers behind moves made by both the United States and Russia despite rhetoric from both countries frequently designed to mask motivations and concerns as much as flag them. Issues pertaining to cross-border threats, stability, and a peace process cannot be separated from Afghanistan’s neighbors. The trouble is that thanks to U.S. strategy, all other regional actors are forced to hedge, address their security concerns, or else prevent an unacceptable outcome for their interests. Discussions of Russian-American strategic tensions and dynamics in Afghanistan fall prey to a twin “prestige fallacy.” Analyses of Russian foreign policy underpinned by the assumption that it wants to project its great power status are frequently facile attempts to explain state behavior on the basis of optics and psychology rather than material interest. Russia exaggerates the extent to which ISIS is operating in Afghanistan for several reasons. First, the Taliban’s goals are ultimately national. Moscow doesn’t care who’s in power so long as it has a stable, unified state with which it can negotiate over its security concerns. An end to fighting in Afghanistan and a neutralization of the threat posed by transnational terrorist organizations requires border control. Border control requires peace of some kind. Second, Russia’s domestic anti-terrorism operations and intervention in Syria have created new security threats with regard to ISIS and transnational actors. Whether or not it’s productive and entirely warranted, Russia wants to have a say in security outcomes in Afghanistan because of its porous borders and the possible arrival of extremists from elsewhere. Though it remains an exceptional event, ISIS claimed responsibility for the deaths of four cyclists in Tajikistan in an apparent attack. In the case of the United States, the inverse problem persists. Russia’s policy is linked not only to perceptions, but to an assumed anti-American agenda. 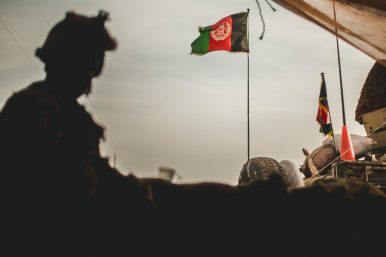 The agenda may exist, but the strategy – or lack thereof – employed by the United States in Afghanistan has had numerous effects and implications for external actors and neighboring states with stakes in the outcome. “Prestige” and a focus on appearances without questioning the efficacy of U.S. strategy creates an incomplete picture as to why Moscow and other states have acted as they have. Washington has the financial and military resources to act unilaterally in Afghanistan without too much concern for other stakeholders. To underscore the point, a study carried out by Neta C. Crawford of Brown University last year found that post-9/11 wars and military operations had cost taxpayers more than $5.6 trillion since 2000, when estimated future costs for veterans are included. This preponderance of resources has enabled an utter failure to set a realistic strategy, most recently revealed by word that U.S. forces would once again focus on securing urban centers in a never ending back-and-forth over territory with the Taliban. Structurally, there cannot be peace without a multilateral process that engages states Washington would rather ignore or else fight. Iran, in particular, has a legitimate security interest in supporting the Taliban. It’s surrounded by U.S. military assets, has been and is again being heavily sanctioned, and knows there’s a considerable lobby seeking the collapse of its regime. Asymmetrical means such as providing arms to a group fighting the United States in a neighboring state make sense. Pakistan has an explicit interest in preventing a strong state from forming in Afghanistan lest it align with India. Now that China is Pakistan’s biggest economic partner and has a growing array of investments and economic ties across Central Asia, it’s a player as well. Russia needs to maintain a role in Afghanistan for the sake of its regional influence and is using the limited means it has to do so just as smaller states like Uzbekistan offer new leadership. By choosing to pressure Pakistan and steadily escalate tensions with Iran, Washington has all but guaranteed that other actors respond as they have. That may mean trying to provide for their own security by deepening political ties with the Taliban. The fact is that many statements from U.S. military officials on Russia’s role in Afghanistan are consciously opaque because they really concern Iran. Therein lies the great tragedy of U.S. policy: unilateralist escalation has replaced diplomacy. Russia, Iran, Pakistan, China, and the Taliban all have interests too. They can’t be ignored without serious consequences. One of them is forever war in Afghanistan.